Charming house of local stone and wood architecture with direct access to the large garden of "Le Petit Coeur", small mountain residence of 7 apartments. You will appreciate it for its charm and its functionality: Disposed on 2 floors, with on the ground floor a large living room with kitchen and dining room, living room, storage room and bathroom (shower, toilet, bidet, washbasin, washing machine) . Upstairs, 2 bedrooms under the roof: a double bedroom with balcony and large quadruple room (2 single beds and 1 matrimonial or 4 single beds) and a small bathroom service with sink, toilet and bidet. Located in the heart of a small green and quiet rural village, Le Petit Coeur is an old farmhouse restored with taste and respect for local architecture with 7 apartments full of charm and with the best comforts. The Little Heart has a large garden for relaxation and the simple joys of outdoor living. A warm and friendly welcome to make you feel at home and the residence "The Little Heart" will become your perfect little world. 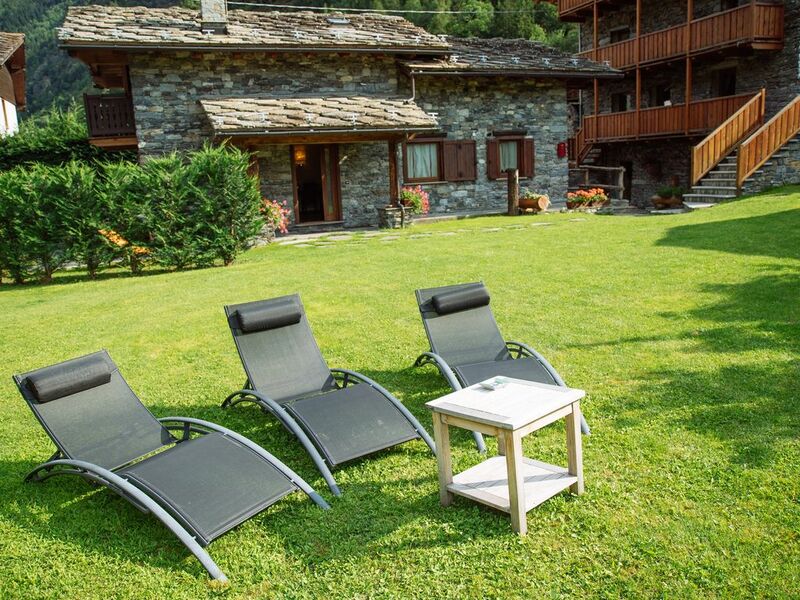 Can accommodate 25 people, our small residence, you will spend a stay in the countryside and facing Mont Blanc, in an intimate and soothing atmosphere where time has stopped and where you can relax. My husband is an clever carpenter native from the valley, with Venetian origins. I am French and work in the tourism sector. We met in 1990 in Chamonix and decided that our life would be here in this small secret paradise that is the Aosta Valley. We wellknow our Valley and hope that we can somehow be humble ambassadors and help our hosts to a memorable stay here. Looking forward to meeting you. Valérie and Mauro. The residence Le Petit Coeur, of which the villa is part, is an old countryside farmhouse existing since the first years of the eighteenth century. With enthusiasm and foresight, the owners - who are also distant cousins ​​- have transformed a modest home into a charming residence and trust by choosing us as managers. The residence "Le Petit Cœur" is an intimate and reserved place with 7 apartments in mountain style, full of charm. You can enjoy a large garden with a spectacular view of the mountains and the surrounding nature for total relaxation. A private parking, a ski/bicycle storage and a tavern with bar service for optional breakfast or an aperitif are the complementary amenities and a 2nd green space for children to play in complete freedom. Your pets are welcome. View more about Valerie L.
Outdoor dining area reserved for the occupants of the Villa. The garden is available in common with the occupants of the residence "Le Petit Coeur"
Le jour du départ, la maison doit être laissée en ordre, les déchets ménagers emmenés à la collecte communale située à 150 mt et la cuisine, vaisselle et ustensiles nettoyés. Dans le cas où elle serait rendue en grand désordre ou de nécessité de nettoyage à fond de la cuisine par notre personnel, un supplément de € 50,00 sera appliqué.